This page contains links to Rhythm Touch manuals for electrical muscle stimulators and instruction sheets available for download. If you are unable to view, please download the Free Adobe Reader using the button below. This PDF fact sheet shows tender points and instruction for using the Rhythm Touch for Fibromyalgia Pain Relief. Click the link to begin downloading. You may also right click and choose “Save Link As…” to save the file to your hard disk. Fibromyalgia Tender Points Instruction Sheet – Format: PDF (75 k). This PDF instruction manual for the Rhythm Touch Q and Rhythm Touch 2-Way. This electrical muscle stimulator manual has been specially prepared for painreliefessentials.com in a large easy to read format. You may download and print a copy for personal use. Please be patient as it may take some time for the download to be complete. Color charts have been removed from the download edition to reduce size but are included in the large printed edition available for purchase. Email address is required to download. 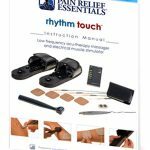 Click Here to download free Rhythm Touch Manual electrical muscle stimulator manual – August 2017 Revision. Format: PDF (616 k). Please follow the following link for the Advanced Foot Energizer Online Manual (opens in new page). To extend the life of your Rhythm Touch pads please read about caring for your Rhythm Touch or EMS pads. – Format: Web Page.